The crews that were using the lot where New Japan, Cuban Revolution, et. al. once stood and as a staging area to work on the AS220 Mercantile building have barely had time to clear out and; wham bam, there’s a parking lot. 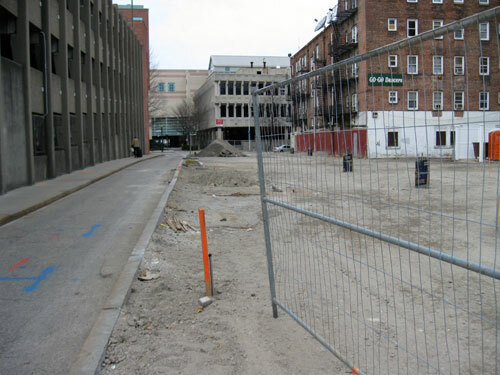 The lot was cleared back in 2008 to make way for the Hotel Sierra. Then pretty much the next day the Great Recession set it, sigh. So it has sat. It was being used as a staging area for the AS220 building construction, now that that is over, parking! We’ve been talking about this ad nauseum, but our regulations still make parking an approved use, so here we are. I can’t say there is any such thing as a good parking lot, but there are ways to make them less bad. This lot isn’t being less bad. See that curb creating a Dunkin Donuts cup collector landscape strip. First of all, could it be narrower? There are provisions for how wide a landscape strip needs to be on an ‘A’ street (which Washington is) and that strip looks to meet it to the millimeter. It couldn’t be a touch wider? But what really bothers me is the curb itself. Part of the reason for the landscape strip is to prevent every inch of land in the city being paved. The landscape strip should collect some runoff. With the curb, none of the runoff from the lot will make it’s way into the landscape strip, all the water that falls onto the lot will pour into the streets, into the sewers, and mostly, into the Bay. When we pave everything, and don’t give the water anyplace to go, it does this. Are we really giving this lot another curb cut? There is no curb cut here now. Why can’t the lot have an entrance off of Beverly Street? So the sidewalk is going to have a curb cut for this lot, for Beverly Street, and for the parking garage, all right on top of each other. There’s also a new curb cut for this lot on the other side of the block onto Fountain Street. The city loses street spaces by allowing these curb cuts. Another new parking lot, which I meant to write about here months ago is at the corner of Eddy and Weybosset Streets. You might know that location as where the Downcity Diner used to be before it burned down. Most recently is was the site of the proposed Smith-Mathewson Building. A small liner building which was to front Weybosset Street. Back in September I was walking by the site and saw a parking lot being built. A few months ago, Stanley Weiss told us that he could not get financing for the liner building and wanted to build out the lot for parking until a building was financially feasible. We pointed to the provision in the zoning ordinance that prohibits a surface parking lot in the Downcity District unless it is shielded from an A-Street by a building (like what he had proposed). So instead of seeking a variance for a permanent lot, Weiss opted to petition the director of the Dept. of Inspection and Standards for a two-year temporary parking lot. The director has apparently approved this. The zoning ordinance does not require Downcity Design Review Committee approval of temporary parking lots. THE HELL!? The Department of Inspections and Standards can just wave a wand and invalidate the Zoning Ordinance. They don’t have to consult DRC or the Planning Department, you know, the people tasked with how the city is built? It could have been nearly anything other than a parking lot. And if the applicant wouldn’t agree to that, DRC could have just said, “no, you get nothing, keep the lot clean and empty.” We needed the applicant to go back to DRC to force these concessions though. This running to one parent (Inspections and Standards) when the other parent (Planning) says no, has got to stop. Transitional Uses: The intent of this Ordinance is that new construction shall immediately follow demolition. Therefore, unless the applicant can demonstrate that through no fault of its own, construction cannot immediately follow demolition, no transitional uses shall be permitted. Should the Director find that there has been a delay in starting new construction, due to no fault of the applicant, the Director may permit a transitional use for up to one two-year period, or until a building permit is issued, whichever comes first. Notwithstanding the other provisions of this ordinance, a transitional use may include a surface parking lot, but the parking lot must be landscaped in conformance with Section 502.2 D) and E). The “Director” in this case is the Director of the Department of Inspections and Standards. This language was added to the Zoning Code in 2004. The Planning Department objected to the language at the time and hopes to remove it when rezoning takes place after the adoption of the new comp. plan, which should be happening soon. We have a brandy new City Council and a brandy new Mayor coming in in January and it is never too early to contact those people and let them know that you support removing the provision for “temporary” parking from the Zoning Code. PS: The “Temporary” Old Public Safety Building Memorial Parking Lot™ opened in 2007. I hope one of the things that Mayor Elect Angel does is an audit of all the departments to find out where there are cracks that sh*t like this is falling into. Put together a two person team who do time in every single department, make a gigantic and legitimate flow chart and he could look at all this stuff and make sure that the right hand knows who the left hand is slapping on the back. This is just so UNACCEPTABLE and the list of these kinds of things just keeps growing. Downtown parking regulations should be changed. Temporary parking lots should be prohibited all together, under any circumstances. Variances, special-use permits, waivers, or special permission by the Design Review Committee, Planning and Development, or Inspections and Standards should be prohibited. New installations of surface parking lots for Public Parking use should be prohibited. Multi-level parking facilities for Public Parking use should be permitted. Requirements to provide active ground floor uses should be retained for multi-level parking facilities. All zoning parking requirements for Downtown should be eliminated or made optional. If there’s a shortage of parking, the market will provide it, if there’s money to be made. The City should ask for enabling legislation from the General Assembly to allow the City to levy a parking space tax. For the last 50 years or so Providence’s land-use regulations has encouraged automotive uses over any other use. The effect has been as steady destruction of the City’s landscape. A war likely wouldn’t have produced as much destruction of buildings as have this blind acceptance of these parking regulations and attachment to car culture. The thing that boggles my mind is developers claim it is not financially feasible to build end up destroying the long term viability of the property by eroding the very city that makes it worth anything in the first place. Thus making sure it will never be viable. Finally, how can the department in charge of enforcement also be legally permitted to approve exceptions with no public review? This drives me crazy as well… Where does one even begin to complain about this? The Mayor’s office? What government arm has the magic wand to wave to get these regulations changed? It’s not feasible for developers to build partly because of the parking requirements. If all that they were building were a building and not a garage as well construction costs would be lower. The general rule of thumb is that one surface parking space costs around $10,000 to build (land and surfacing), a structured space (garage) $15,000-$25,000 each and an underground space can be as high as $35,000 or $40,000 each. Developers often had already paid for the land where many of these temp-lots are located. They demolished the existing buildings in anticipation of constructing a project. When the economy went bad and banks stopped lending, rather than pay the real estate taxes out-of-pocket, they would plead a hardship and get a legal “two year” temp-lot from whatever agency would approve it to pay the taxes and generate income to recover some of their investment in the site. When the economy and lending environment improves, most of the temp-lots will remain because unless there’s a hyper real estate market as we experienced several years ago, construction costs will be too high to build a building that incorporates a required garage. And for now, it’s virtually impossible to get financing for new ground-up construction, so we’ll be living the current batch of temp-lots for long time, maybe decades. I’m convinced there’s a continued conspiracy to suburbanize Providence. Done and done. This is an example of how ponderous it is to ACHIEVE something and how effortless it is to DESTROY something. So many people are working hard, donating time, contributing money, developing bottom-up design alternatives, establishing foums and blogs for ideas … and then city and state governance fails so miserably to advance best contemporary urban practices. Exactly what political constituency is IN FAVOR of tax breaks for failed developers, parking lots that cause this kind of destruction of the city, the degredation of the public realm with equally destructive traffic engineering, and on and on …. ? P.S. I really miss New Japan. “Department of Urban Sustainability.” Two person office, no support staff, working out of all the different offices in Providence with their laptops making all the right connections, and severing the wrong ones in order to make Providence more sustainable environmentally, urbanlly, economic developmently, educationally etc. Like Municipal Myth Busters. I get the economics of the situation and the parking lot at the former downcity location is a bit of an exception. The issue remains that there are repeated cases of demo to create these lots and the city seems powerless and in some cases seems to support the creation of surface lots. Theses developers are systematically destroying the tax base by devaluing the properties around them with eyesores. I am not sure why it is in the cities best interest to bail them out of their underwater investments with zoning exceptions that don’t help the cause of increasing the overall value of the city’s tax base. Besides car culture itself, the zoning regulations combined with a limited public transit system and have clearly been suburbanizing the city for decades. Most of the city was platted before any of the zoning ordinances. The majority of developable lots have been designated “sub-standard” by zoning. Where once a 3-decker could be built most anywhere in the city on these existing lots, today you’re lucky if you can build a small two-family house on the same lot. This is a specific example, but is a consistent theme that’s imbedded in the City’s zoning rules, which is suburbanization. Another problem is that the bulk of the current zoning was adopted in the early 1950s. The 1950s as everyone knows was the beginning of the great migration to the suburbs. The thinking of the day was to adopt widespread private car use and single-family housing. The concept for downtowns became places where you went to work or sometimes shop and usually only during daytime hours. The oldest people participating in City government today were kids when the current land-use rules went into effect in Providence. Also, it’s likely that many people in City government grew up in suburbs. There’s general a lack of group memory of what the city was in an earlier time or what it should be now. Many of the loudest screamers declaring the lack of parking downtown are suburbanites that commute to the city, who are willing to pay $10 to park. How many RIPTA rides does $10 buy? Only 8% of Rhode Islanders use public transit. If the public transit were upgraded to better serve suburbanites and city dwellers, the market demand for parking space would be reduced and there might be a better incentive to build on the vacant lots instead of paving and striping. There are several reasons for the developers to demo properties. By demolishing a building they reduce their real estate tax burden on a site. If a property were historic, a demolition would allow more flexibility in redesigning a new building and would limit the impact of review commissions in dictating the appearance of their property. In some cases, like the Fruit and Vegetable Market demolition, the existing two-story structure was designed for one very specific use that would have been difficult to convert to a hotel, which is what the developer wanted at the time. Also the zoning for that site permitted greater bulk than a two-story building. However, much of this all goes back to parking, because of the car addiction and necessity for parking, it would have been impossible for the developer to provide on-site parking, if they retained the existing Fruit and Vegetable Market. I don’t know the figures, but I suspect that it’s more lucrative to operate a parking lot than rent a half filled two- or three-story retail/office building. I don’t understand what motivates the city, unless they’re just cowards terrified of litigation? Regarding the fruit and produce market–when the developer bid on that project he knew goddamn well what its limitations were. The idea that he had no idea that it would be difficult (and yet not impossible) to make it into a hotel or whatever crap he trotted out (i think i saw all retail, a best buy, a big crate and barrel furniture store–all of which were clearly lies) simply bullsh*t. The entire RFP was all about keeping the structure and building whatever around it. And yes, i think the city is deathly afraid of litigation AND are cowards. Other cities manage to not turn entire swaths of their downtown into surface parking quite easily, what is so special about Providence that makes it impossible to keep it from happening? What the developers along with the hospitals and to some degree the schools are doing with this demo process is land banking. As for the fruit and produce market the developer probably was most interested in was retail, since that’s their “specialty.” The buildings are gone, which in many cases was probably the original intent. With a new Mayor on the way in, hopefully this practice can be put to an end. maybe the taxes on these properties should be revamped so that the developer is taxed AS IF there was a 5 story building with retail and office on it complete with payroll, property and inventory taxes, rather than an empty crappy parking lot. Maybe they wouldn’t be so eager to trot out boldface lies to the boards and commissions who approve the projects. At the Produce Warehouse, Carpionato bought it from the state, and when the state forgot!!!!!!! to put a re-use clause in the purchase and sale agreement, they sought to have it torn down. Funny the city allowed the crosswalks at Dean & Atwells to go unpainted for months and the walk lights to not work for months, and the sidewalks to be missing for months, a clear “Public Safety Hazard” but no one was ever ordered to rectify the situation. I guess the pedestrian lobby doesn’t make enough campaign contributions. Art In Ruins has the whole sad ugly story. And some stuff on our site here. It is such a common refrain from developers, that ‘when the economy turns around’ these surface lots will be put to a more attractive use. And yet, I have never seen a single surface lot reclaimed in this city for better uses after having been installed…not a single one, ever! Which is tragic, because if that trend continues, Providence will be another New Haven in a decade or so. As a few people on here have suggested, the legal proscription of surface parking, whether as a last resort in cases of ‘hardship’ or not, would solve the problem once and for all. I think a letter of concern to the incoming mayor is in order! Talking about streetscapes got me thinking of Mayor Menino’s Main Streets program that took off around 1995. It’s spread around the country, and I’m surprised Rhode Island has never adopted it. One of its core aims was to help steer financing for building and renovation projects towards city neighborhoods. Just judging from the transitions the neighborhoods I’ve been to took, it’s been by and large a great success. Something like a coordinated sustained and never ending effort to keep investors coming in, development plans on track, buildings looking good, might help keep parking lot development from having a chance to occur this way. There’s even a special “Holiday on Main Streets” Parking Program, that provides for free two hour, on-street parking on all city main streets for five consecutive Saturdays, starting on Black Friday, (Nov. 26) and ending Dec 26. You can even pay parking fines with toys. Ok, I’m done. It does seem to me, that making municipal garages out of some of these sites a la New Haven, or Cambridge and then just charging a pittance (at least for starters) for parking would be a reasonable strategy. If not wildly respectful of property rights. Providence I believe has an essential interest if it is to compete with Lincoln, North Smithfield, and Warwick to control the cost of parking. If they can add enough spots, and make it so much less than surrounding surface lots there isn’t that motivation to further tear down buildings. It’d help with present vacancy rates, it’d lessen parking requirements for new construction, and it’d give landowners some confidence they could build. RIPTA is ok, but properties (and property taxes) are worth more if economical parking is assured close by, employees are easier to attract, and service businesses can be more service oriented if they have parking. It’d be nice to see the city see this as a public utility and not leave it up to the free market which will inevitably destroy some buildings to provide parking for others, and give us a patchwork city and tax base – And they could start with a garage next to the Arcade IMHO. PS. I’m not usually a hippie, but the vacancy rates, and tax base reduction is getting out of hand. I am not sure how often you guys are downtown, but I’m there every time I visit (which is almost monthly) and I lived in Providence for 20 years and worked downtown for many of those years. And parking is not the CRISIS!!!1!!! that everyone makes it out to be. Convenient, rightoutsidethedoor parking might be, but if you are willing to walk a block or maybe even two (HORRORS!) there is usually plenty of parking to be found, unless Taylor Swift is in town. That mall parking lot at Providence Place has to be the biggest clusterf*ck of parking this side of the University Heights plaza lot and people pay at least a dollar to park there. So the idea that parking has to be free AND plentiful in order for people to go there–I’m not sure that holds water. Every time a parking lot goes in where there could have been a business/building, we lose even more ability to draw people downtown on a regular basis. All the business that could line those streets with retail, restaurants, small offices , whatever just don’t materialize and why would people come downtown to visit a parking lot on a Tuesday night? I think about the people who HAVE made the investment in building a business downtown only to end up being next to not just a gigantic parking lot that isn’t even free to park in after all that. Continuing to build parking lots out of viable building spaces just is going to reinforce the idea that there are bad guys lurking in dark corners of every parking lot, and behind every car downtown. I will say that I think part of the problem is that RIers never learned that 1. Downcity isn’t a scary place and 2. how to parallel park. Except when Justin Beiber is in town. I agree, the lack of parking isn’t so terrible or an epidemic, however tearing buildings down for surface lots, and removing improved lots from our tax base is. I’m (probably like most people here) downtown everyday, and I feel for the shops on Westminster that are constantly on a death watch, and landlords downtown that are having to sit with empty buildings, because it is A LOT easier to go to Garden City to shop, and have new businesses locate to some disposable wired suburban office park where they have free parking outside. We all know it, but it bears repeating that we have a bunch of (beautiful) old buildings that were built at a time when they didn’t need to provide parking for their inhabitants, and are generally not so convenient/adaptable for people’s expectations about a workplace/shopping place in 21st century America. Certainly we can all rail about whether those expectations are a good thing and I’ve done so myself (everyone wants a car, next to door parking), but that doesn’t make them go away or untrue. If it is to stop, I think most of us agree the economics need to change. Parking needs to get either more or less expensive – my contention is that the former (ie. increasing tax rates on unimproved lots) exacerbates vacancy rates, hurts storefronts/offices and our city. And while the latter has the undesirable consequences that you’ve described, it makes our existing building stock more competitive. Not that I’m naive enough to believe any of it will happen, but it is interesting to see people’s opinions. Tax surface lots at a higher rate than garages. Tax garages without ground floor retail/office/whatever space at a lower rate than garages with that type of space. Tax surface lots that were created to be temporary at the highest rate to push the developer to actually build something or sell to someone who will. How about something crazy like making a demo permit more expensive than a building permit to the point that it makes more sense to rehab the building in most cases? 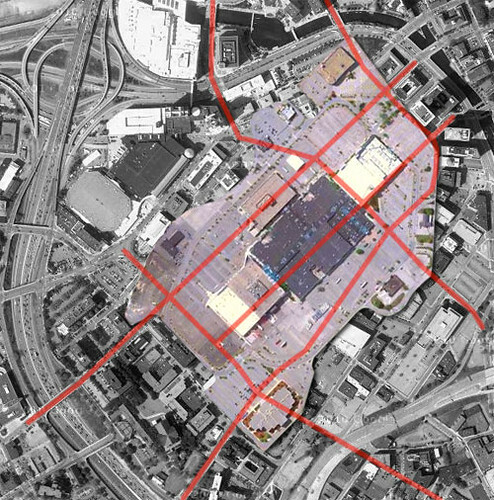 What you see pretty quickly is that the Mall’s footprint captures pretty much the entire urban core and most of the major venues – the market, Center in the Square, the Taubman Museum, the Campbell Court Transportation Center, Kirk Avenue Music Hall and The Shadowbox, and the bulk of Downtown’s restaurants and galleries. Also within that footprint is six parking garages: Wachovia Tower, Campbell Court, Market, Church Ave (both the newly renovated one at the Market and the one across from Texas Tavern, and Williamson Road. 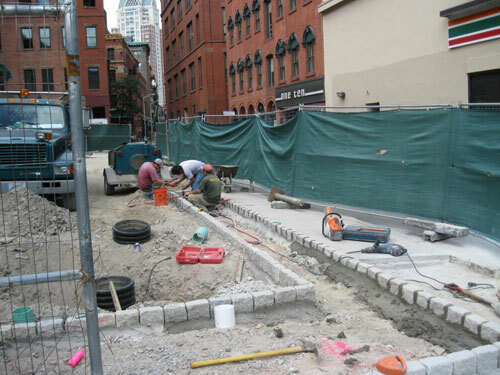 There are also several surface lots and many on-street spaces. Warwick Mall would produce similar results if compared to Downtown Providence as the Valley View Mall overlay on Roanoke. Of the great many horrific pieces of auto-centric city planning that were foisted on this city I think the service roads are actually the worst. DOT obviously thinks of these roads only as ways to get to the highway, and have forever. hmm, I think the great comcast takeover of the Northeast is propagating. This comment went to the wrong place. Only if you rule out traveling any way but by car. And even then, it always puzzles me how people who get $10, $2o or more per hour or at work will spend half an hour and $2 gas to avoid paying $5 to park. Subsidized parking is an idea whose time has gone. If market rate parking can justify the cost of a parking structure (with decent streetfront retail) – OK. There really needs to be a huge tax on surface parking in this city. Thank you for being on top of this. 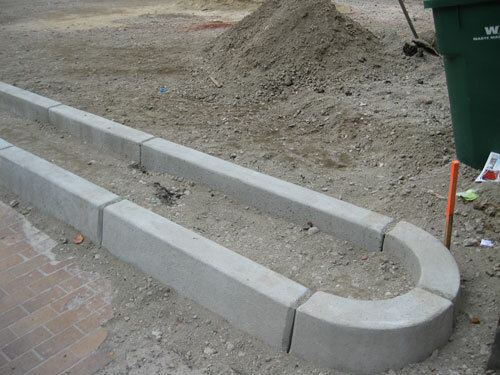 We really have to pressure City Hall about the zoning loophole, but it isn’t too late to stop all those curb cuts. The parking lots are bad enough, but zero vision is going into their execution. As to the landscape strip | prior to its life as a cup-catcher, a “landscaper” will shove four red azaleas into it, and they will all promptly die. Then it can start catching napkins as well as the cups. Much this problem has to do with the psychology and culture of the car. The follow are speculations about that psychology, some of which may have been said before or obvious, but are worth emphasizing. The maximum distance to a parking space is usually between 300 and 400 feet in shopping center or mall parking lots. The long block length between Washington and Westminster Streets is 400 feet. Parking two or three blocks away would be much further than 400 feet, which might cause a sense of inconvenience. “What if I have to go somewhere far away? I’ll have to walk all-the-way back to the get car.” If someone is in the Jewelry District at a restaurant and has to go to Providence Place Mall, depending on where, it could be almost a mile walk, which is a good 15 to 20 minutes. So if you have a car, it would make sense to drive, rather than having to walk back later, especially if the weather is lousy. This could in part contribute to the Ã¢â‚¬Ëœcheap effect.’ Most people would only want to pay the $10 once not multiple times. “If parking in the suburbs is Ã¢â‚¬Ëœfree,’ why should I pay for it in the city?” Also, if on-street parking is incrementally cheaper and you only have a 15 or 20 minute errand, it’s worth driving around to try to find a spot before committing to a lot or garage. Whatever form the Core Connector takes, as long as it menders through Downtown with service under five minute intervals and has frequent stops, this would likely reassure people to leave the car in one at one location or at home. There should be a hefty parking space tax. Though politically unthinkable, if there were one statewide maybe the roads and bridges, as well as RIPTA would be in better shape. The cub-cut question is interesting. It’s not just about a temporary parking lot. There are a number of different approvals that have to overcome. It seems that all of the regulating agencies are allowing this to happen. Perhaps to some degree even Planning, if they’re not fighting on details of how a planting strip is supposed to comply with zoning. I suggest we start the revolution by voicing our concerns here. If everyone here sends something, maybe even combined with a physical letter, I think it has a high chance of being an issue the new administration will be receptive too. Indeed, I noticed on Angel Tavares Facebook page, a post for reclaiming on-street overnight parking for city residents. I know PPS is trying to get this on the Mayor-elect’s agenda. It would not hurt if others added their voices to the chorus so that the Mayor-elect knows that many people are concerned about this issue. Another problem is that downtown doesn’t carry the variety of stores that people crave and that the malls currently provide (Although I thought Warwick mall was emtpy? Haven’t been there in ages). It’s self-propagating – there aren’t any clothing stores downtown so no one shops downtown and in turn, anyone opening a new clothing store won’t put it downtown. I wish they had put all of the money they put into Providence Place into transit and revitalizing shopping across Washington, Westminster, Weybosset and the Arcade. I’m really curious Andrew what you mean, as far as I know almost no municipalities (except Cambridge) have ever subsidized CONCENTRATED parking solutions in order to facilitate the protection/competitiveness of their historic building stock . Did it exist at some point, somewhere, that I’m unfamiliar with, and why did it fail? Seems like if you have a glut of anything, prices come down, and the incentive is to invest in other things that take advantage of the glut (like rehabbing a historic property next door) – but then again I’m no economist. Not trying to argumentative, or clinging to hope that it’ll happen, just curious if there is a history here I’m unfamiliar with, and what the fault of this reasoning is. Thanks. I’ve been getting phone calls about this issue all week (both the parkinglotification issue and the demolition issue). There is certainly a feeling around town that the status quo needs to change. Regarding municipal subsidized parking, I am not sure of the whys and hows but when I lived in PDX many of the garages there were subsidized and called SmartPark. They were pretty cheap. This was in the early 90s and they were relatively new. They were easy to get in and out of, and if you parked illegally or past the time limit on the street, your car was towed away instantly. Well, first you’d get like three tickets over the course of an hour and then you’d be towed away. So it make a hella lot of sense to park for fifty cents an hour in SmartPark instead…. That is the problem: 50 cents an hour to park in a space that costs $2 an hour to build and maintain. Some combination of tax exemption, bond guarantees, property tax increment, municipal payroll for operations etc. makes up the difference. Every person who drives downtown gets a far bigger subsidy than every transit user – even before counting all the other subsidies to driving. This has to stop. Andrew, I’m not sure your numbers are 100% solid, 😉 but the point is taken. Certainly I wouldn’t advocate an investment, unless I thought there was a payoff eventually. Plus I don’t think you need to worry, it isn’t gonna happen. That said, I’m wondering how high you think the taxes should be raised – high enough that they could build for the same amount paid over __ years. And whether justice is served by taxing people who use less city services (surface lots), than those that are reliant on city services – ie. developed lots? I am also curious if you push those numbers really high what you think the effect is on businesses that are prospectively looking at real estate downtown. I would posit, that if you want to exacerbate the vacancy rate downtown (which in my mind is problem #1), raise the floor that people have to charge for parking so they can pay their taxes. It is a beautiful city, but as the costs rise, and the density, and vibrancy ebb, it is not that desirable to be there. Of course I believe the opposite is also true – make those buildings competitive and fill them, their value increases, and there is no better place than the city. I guarantee you the first question anyone looking at space downtown has is where am I going to park. Right now after salaries, health insurance, and rent it is your fourth highest expense. But like it or not, it’s a downright necessity if you want to attract white collar employees in a small city whose suburbs are geographically difficult to serve with, and were not planned around, mass transit solutions. Otherwise they’ll in ever increasing numbers go to the Jewelry district, North Smithfield, Warwick, Quonset, etc… places whose ONLY substantial competitive advantage (IMHO) is that parking is more economical. 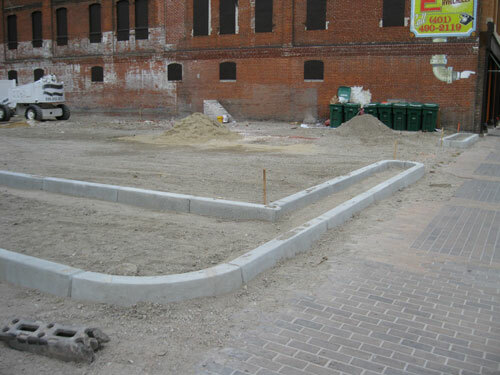 $20k – $30k construction cost per space is commonly mentioned for structured parking. At 6%, over 20 years, that is about $8.00 per weekday. Now add maintenance, security, etc. Good point about the suburbs. Tax those parking spaces too. Free parking is not free: It all gets paid for somehow, and that is a subsidy to driving. Compare spending $80 million for a streetcar with building 3000 parking spaces. And none of it is gonna happen, so I think I’ll stop now. I’ll be happy the day some company(s) can move into the Lapham building (bracketing Tilden Thurber) and they have suitable economical arrangements for getting their folks into the city. Just too many empty buildings downtown wasting away.